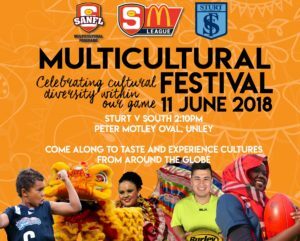 Multicultural vendors selling cultural food, crafts and other market goods are invited to submit expressions of interest to participate in Sturt Football Club’s Multicultural Festival at Unley Oval Monday June 11, 2018. Expressions of interest applications must be submitted to the Sturt Football Club by 5.00pm on Monday 14 May 2018. To proudly represent the wide range of cultures in South Australia at the Festival only applicants selling food or goods from a particular culture or nation are permitted to be part of the event. Sturt Football Club expects to notify applicants of the outcome of their expression of interest by 14 May 2018. *Please note that submitting an expression of interest form does not guarantee you a place. To find out more about vendor operating times, fees, site location and equipment, read our Stallholder Information Form.